Claw toe deformity is common. Hyperextension of the metatarsophalangeal joint is the key component of this deformity. The proximal and distal interpahalangeal joints remain flexed. The plantar plate is one of the structures responsible for the stability of the metatarsophalangeal joint.1–4 The plantar plate experiences extension forces imposed by toe-off. The weak attachment of the plantar plate at the metatarsal neck attenuates or ruptures, allowing the plate to subluxate distally and dorsally, until rupture of the thin proximal synovial attachment occurs and the metatarsophalangeal joint dislocates. The intrinsic axis alters and the intrinsic muscles fail to act as efficient flexors of the metatarsophalangeal joint.5–7 Painful callosity of the overlying the proximal interphalangeal joint and beneath the metatarsal head are thus presentation. Conservative management consists of taping, padding, shoewear modification or insoles. All may help to relieve the symptoms, but do not correct the deformity. Surgical options can be divided into soft tissue8–12 and bony13–17 procedures. Flexor tendon transfer has been reported as the most consistently successful treatment in stabilizing the metatarsophalangeal joint and correcting the flexible claw toe deformity. It works as a static tenodesis. However, the function of the tendon of flexor digitorum longus is lost and patient satisfaction has been limited due to stiffness and residual discomfort at the metatarsophalangeal joint. A shortening osteotomy, such as Weil’s osteotomy, can be another option. It is indicated if the joint cannot be adequately decompressed by soft tissue release. However, a stiff toe commonly results. Resection arthroplasty or arthrodesis will result in loss of the joint integrity. Plantar plate tenodesis tackles the primary pathology of plantar plate attenuation. 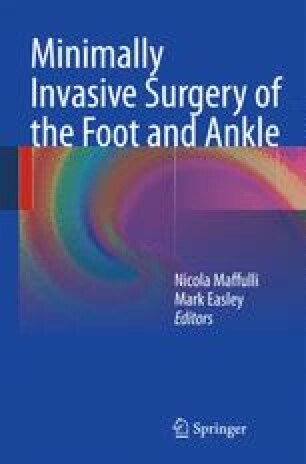 Postoperative stiffness and discomfort should be less of a factor if the stabilization is addressed at the level of the plantar plate rather than performing a tendon transfer.18 Moreover, early toe mobilization is allowed and this can minimize the risk of toe stiffness.